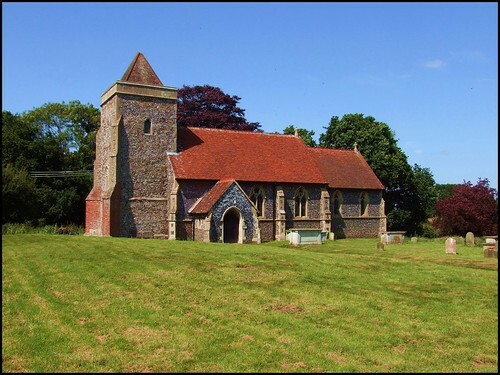 Boyton must be one of the least visited of all Suffolk villages. It isn't on the way to anywhere, other than the depopulated hamlet of Capel St Andrew, and is secluded within the lattice of narrow lanes that spread between the Rendlesham forest and the secret creeks and marshes of the coast. Despite this, it has a rather suburban feel to it, in the pleasantest kind of way. There is little that is ancient here, but there are some nice houses with drives, and 18th and 19th century cottages which include the former post office and pub. A slight distance west of the village, on the road to Hollesley, stand the Mary Warner Homes, a lovely set of almshouses on three sides of a courtyard. They have been considerably restored over the years, but date essentially from the middle of the 18th century. Mary Warner was the philanthropic lady of the manor, a title she can hardly have expected to inherit, being the youngest daughter of a youngest son. But her father's older brothers were both received into the Catholic church, becoming Jesuit religious on the continent. And her older sisters and brother all died. She herself was only in her early fifties when she died in 1738, and her will set up a trust for the establishment of an Hospitall or Almshouse for the entertainment of Twelve poor people six wherof are to be poor men and the other six are to be poor women... PROVIDED always that such poor people to be chosen... be all faithfull members of the Church of England as by law established and no others. That this trust has prospered since, and continues to do so today, can be mainly attributed to the geography of Boyton itself. Firstly, in the late 18th century, a rich bed of china clay supplied potteries throughout the south-east. And later, huge deposits of coprolite, the fertilising properties of which had been demonstrated by Joseph Henslow, Rector of Hitcham, were dug up and sold from Trust land. This wealth rebuilt the church in a mild Decorated style in 1868, to the designs of William Smith. It stands just to the east of the almshouses, in a gorgeous churchyard, maintained as a conservation area. Externally, St Andrew is as attractive as it is possible for a 19th century neo-Norman church to be. The tower is the original 14th century one - or, at least, the truncated bottom half of it. The new church was double the size of the old one, with added transept and enlarged chancel. Inside, not much has changed since 1868; furnishings, tiles and stonework are all typical of Victorian taste. Indeed, it is all a bit gloomy. But the great treasure of this church is outside, around in the north transept. This is the vestry door, a superb Norman doorway. It has three ranges of chevrons, and the splay of the doorway is as deep as the doorway is wide. The origins of this doorway are rather mysterious. There was no north transept before, so it is not in its original place. A visitation to the parish of 1879 reports that the Norman door formerly more than half hidden has been carefully and sparingly restored and placed where it now stands. The trustees, writing to Lord Stradbroke 11 years earlier in 1868, report that the Norman Door (so well known) which it is intended to remove, will be well placed as an entrance to the chancel at the North East end and will be a pleasing object from the Rectory. And yet, it is hard to see where this doorway could have come from, or even that it was ever really a doorway at all. It is too narrow to have been a main entrance, so it may have been a priests door to the chancel. But why so grand, if the other doorways were not similarly grand? Cautley hedges his bets when he suggests that it is a doorway 'made up' of 'unusual and interesting 12th century stonework'. Mortlock probably solves the mystery when he suggests that it is in fact two doorways, one inside the other. The inside one consists of two ranges, and may have been the priests doorway. The other range may have been just one of the ranges of a main entrance. The chancel had been rebuilt at sometime in the 18th century, and the doorway might have ben put together then, hence the trustees' impression that it was original. But one wonders where it was placed to be 'half hidden'. Coming this way in the late 1990s, My visit coincided with a violent thunderstorm, and I was glad of the depth of the splay, while I sheltered from the world ending outside. For the church was locked, and no keyholder was listed. However, these days the church is open every day, another great blessing for all us strangers and pilgrims. Haunting photographs of those named on the war memorial hang in a frame beneath it. Apart from that, there is not a lot to remember, and the interior is as anonymous as any in Suffolk. But the setting is lovely, and this little church is worth a visit just for that, if nothing else.